In cases of restricted flow or reduced capacity conditions, as an option, Advantage supplies manual or automatic low flow bypass circuits on water-cooled or air-cooled portable water chillers. 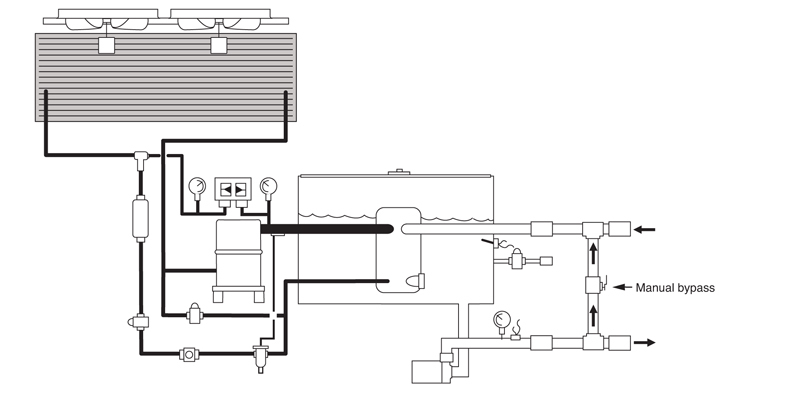 The low flow bypass circuit, whether automatic or manual, is designed to provide the chiller with the proper amount of flow through the chiller's evaporator continually. Automatic low flow bypass circuits place a pressure actuated valve between the from process and to process lines. Advantage presets the valve to open at the pump's dead head pressure to prevent overloading and to provide proper flow to the evaporator at all times. Field adjustments may be required. Water-cooled portable water chiller shown above. Automatic low flow bypass circuits can be installed on air-cooled units also. 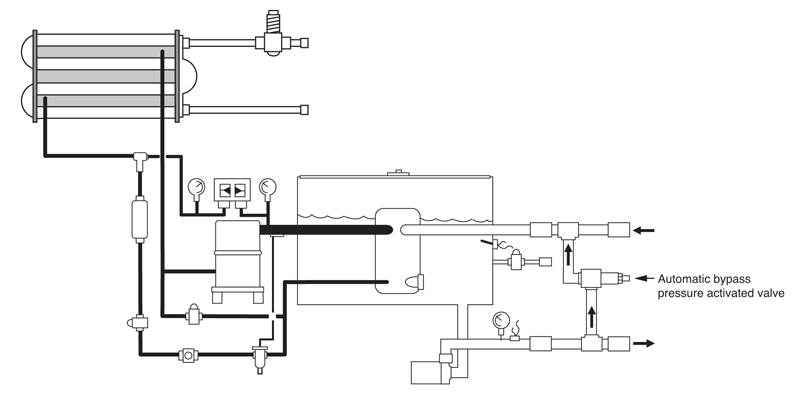 Manual low flow bypass circuits place a ball valve between the from process and to process lines. The valve is shipped in the closed position and then field adjusted based on process requirements. Air-cooled portable water chiller shown above. Manual low flow bypass circuits can be installed on water-cooled units also. For more information about the low flow bypass circuits call the Advantage Sales Department at 317-887-0729. Would you like to Download FYI #144 to your browser?